You use 999 here because the numbers have 3 digits. If the numbers had 4 digits, you would use 9999. Subtracting a number from a string of 9s results in a number called the nines' complement. The nines' complement of 176 is 823. 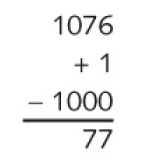 And it works in reverse: The nines' complement of 823 is 176. What's nice is this: No matter what the subtrahend is, calculating the nines' complement never requires a borrow. And this is identical to the calculation I demonstrated using the nines' complement. We replaced the one subtraction with two subtractions and two additions, but in the process we got rid of all the nasty borrows.